When I was young, my mother used to have this huge Jimmy Choo hobo bag that I was fascinated by. It probably weighed 3kgs in itself and took up more space than any bag ever should, but I remember it was nothing short of fabulous. What is more, despite that bag being able to fit about half our household, my mother still managed to leave the house having to hold something in her hand. Throughout my childhood, it seemed like there was no other way for a bag to be but large. Where else would you fit your large wallet, planner, phone, laptop, dog and kitchen sink? Even as a young girl I don’t remember ever having a small day-to-day bag, although I really did not have anything else to carry apart from the book I was reading at the time and maybe a Nivea lip balm of some sorts. 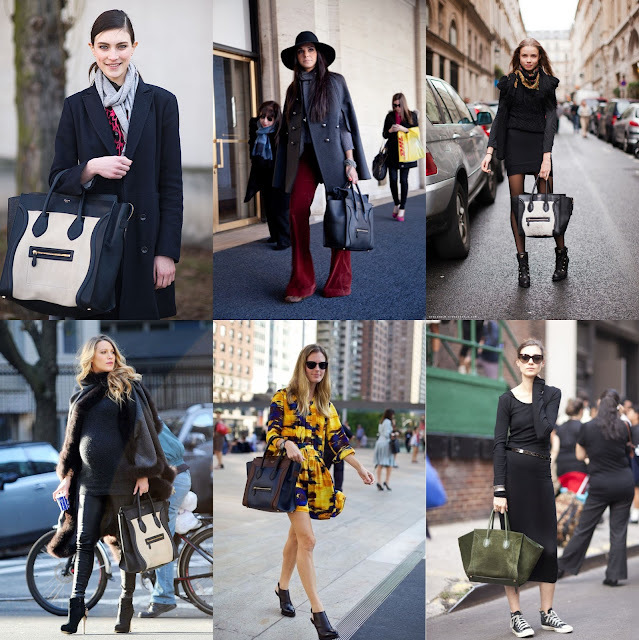 To culminate, 2010 marked the year the Celine Luggage Tote came to life. By 2014 it had already become the bag everyone and their mother wanted. It was definitely the bag I wanted. It weighed a ton and was pretty large, but that’s what bags were supposed to be like, right? Where else would you fit all the useless things accumulated in your previous bags otherwise? We were all in the huge bag bubble. Just after the 2014 Celine Luggage Tote madness, I think someone caught on to the fact that the same bag also came in much smaller sizes, and those started popping up everywhere. The Celine Nano Luggage was starting to gain ground, alongside many other, much smaller and practical bags. The perfect size to fit in your daily essentials, just right to wear crossbody, the likes of the Celine Nano Luggage bag, CelineBox bag or the Gucci Disco bag took the place of the large totes that had been until then everyone’s favourites. I have briefly wondered whether that was the manifestation of women being increasingly busy and on the go, unwilling and lacking the patience to deal with large heavy bags - a move towards pragmatism. That thought has made me both roll my eyes at myself and wonder whether societal change can actually be reflected in as simple a thing as bag choices. Yes, I know how pretentious that last sentence sounds, give me a break. Fast-forward to today and all I can see is small bags, small wallets, small jewellery. Even Kylie Jenner is said to now prefer smaller lips. Tote bags have been reduced to crossbody bags, to clutches, to card holders. We’ve taken a 180 degree turn towards the smaller the bag, the better. I guess size does matter after all. It's not just about small bags, it's about small jewellery too.